These two ideologies – Wahhabism in Islam and Zionism in Judaism – may seem like unrelated entities on the surface. But they are not, as I will explore through the course of this article. Both of these malevolent doctrines could be seen as largely responsible for much of the misfortune in the Middle East today, a situation which by the way doesn’t just affect the Middle East, but as we’ve been witnessing since 9/11/2001 and at an accelerated rate since 2011, affecting the US, Europe, Eurasia, and quite probably the entire world! These two religious/ political philosophies are responsible for decades of violence, war, suffering, and manipulation. They can be demonstrated to be the flip-sides of the same coin. They can both be traced back to the same approximate era – roughly 100 years ago, during the events of World War I.
What’s been the legacy of Zionism and Wahhabism in the world? And what is the truth about their origins? To begin with, here’s an abbreviated history of the origins of first Zionism and then Wahhabissm for those of you who are unfamiliar. “Zionism” is a complicated term to define in some ways, all the more so for the sheer amount of exaggeration and misinformation. There’s political Zionism, which aims to serve the interests of the state of Israel. There’s religious Zionism, which refers to Jewish [or Christian] interest in Israel in terms of fulfilling “Biblical prophecy” or “Divine Will”. These two schools of Zionism could in some instances be entirely separate. People can be political Zionists without being religious Zionists or vice-versa. An example of this would be right-wing American evangelical organizations who are in fact die-hard Zionists for the sake of fulfilling perceived Bible texts. Zionism is just as Evangelical “Christian” as it is Jewish. But the point is that the aim of Zionism originally was the restoration of a “Jewish Homeland” in what was Palestine for 2000 years; a goal that was accomplished comprehensively in 1948 in the shadow of the Holocaust, although it had its roots as an international movement from the time of World War I. Ever since then, Zionism can be regarded as a political movement aimed at furthering the interests [nationally and internationally] of that artificially created nation and at ensuring the security and protection of this so-called State of Israel. Many anti-Zionist commentators also link Zionism – both religious and political – with a concept of a secretive global Jewish agenda to control the world. Zionism in its mainstream form is believed to have originated with Theodor Herzl in 1896, an Austro-Hungarian Jewish journalist, playwright, and political activist. Beginning in late 1895, Herzl wrote Der Judenstaat or State of the Jews. In it he argued that the only solution to the “Jewish Question” in Europe was the creation of a state for the Jewish people. Anti-Jewish sentiments were so widespread across Europe that Herzl saw the creation of a national sanctuary for Jews as the only long-term solution. And thus Zionism was born, or at least this is the mainstream version of events. Other scholars will contest that notion and offer arguments for a much older origin. Of course if we’re talking about religious Zionism as opposed to political Zionism, then the origin is much older and much more mysterious. The notion that the land of Israel (Hebrew: אֶרֶץ יִשְׂרָאֵל, Eretz Yisrael) had always belonged to the Jews or that it was promised to the “Children of Israel” by their Biblical God is an ancient one and a false myth at best. Of course, such profound lunacy has no sound basis for 20th century nation-building, or so we thought and were hoping. It was the colonial powers of the late 19th and early 20th century, particularly Britain, who actively pursued the Zionist agenda under the guidance of powerful and wealthy British Jews such as Lord Rothschild, resulting in the famous Balfour Declaration. The British made grandiose wartime promises (during World War I) to create a “Jewish homeland” in Palestine. Although mass Jewish immigration to Palestine began occurring after World War I, it wasn’t until after World War II and the Holocaust that the agenda was comprehensively fulfilled. Another cornerstone of Zionist folklore is the fabled book, The Protocols of the Elders of Zion, believed by many to be the blue-print for a global Zionist takeover. We will come back to this point later on in this article. Despite Britain’s official actions, however, neither public nor government opinion was unanimous in its support for the excessive commitment made by Britain to further the Zionist agenda. Winston Churchill, in a 1922 telegraph, is recorded to have written of, “a growing movement of hostility against Zionist policy in Palestine,” adding that, “It is increasingly difficult to meet the argument that it is unfair to ask the British taxpayer, already overwhelmed with taxation, to bear the cost of imposing on Palestine an unpopular policy.” This disapproval of political Zionism has continued for all the decades to follow and is even more widespread and vehement today than it was a century ago! And contrary to the view propagated by some that anti-Zionism is “anti-Semitism”, Jewish speakers have at various points also spoken out openly against the Zionist agenda. Among them, Rabbi Elmer Berger published the book, The Jewish Dilemma, in which he argued that Jewish assimilation was still the best path for Jews in the modern world and not the segregation and siege mentality of the Zionist state. In Rabbi Berger analysis, Zionism itself was simply resigning to the prevailing racial beliefs about Jews and playing into them. This is just a fraction of stated opposition to Zionism by reputable, respectable people. I reference that here to illustrate the point that anti-Zionism isn’t just the safeguard of so-called “anti-Semites” and that we should bear in mind the substantial number of Jews who also sternly oppose to Zionism. It couldn’t be denied, even by the most ardent Zionist supporters, that the influence of political Zionism along with many of the actions and policies of their Zionist State have, aside from the long-term oppression of the Palestinian people, contributed massively to the polarization of the Middle East and the growth of Jihadi radicalism. Aside from the destructive, toxic effect that the creation of the Zionist regime had at the point of its inception (in Palestine itself, but also vis-à-vis its juxtaposition effects on Lebanon, Syria and other neighbors), a divisive, destructive effect has also continued through to the present day beyond the borders of the Middle East. It is quite demonstrable, for example, that a longstanding US-Israeli plan for the redrawing of the Middle East map has been carried out in the last several years, toppling independent governments and stable nations and ultimately seeking the balkanization and subjugation of Iraq, Syria, Libya, et al. with the ultimate evil goal of subjugating Iran which is their main target. The alleged Zionist Plan for the Middle East, also known as, The Yinon Plan, was the vast strategy composed to ensure Zionist regional superiority via the radical reconfiguration of Israel’s geopolitical surroundings through the balkanization of the surrounding Arab [and non-Arab] nations into smaller and weaker states. The Clean Break strategy also essentially amounts to the same thing. What we have so far witnessed in Iraq, Syria, Libya, and even Yemen can be seen to play into this US-backed Zionist strategy quite clearly. It is particularly relevant to note that Iraq, Syria, and Libya were three of the most stable, modern, secular, independent, and non-sectarian Arab nationalist states, but instead are now three collapsed, geo-sectarian, wastelands waiting to be carved up into pieces. Through exploring the Greater Israel Project, there’s little question that Zionism has been a toxic and problematic imposition onto the region and perhaps the larger world, all the more so because the Zionist regime has been aggressively propped up, armed, and defended by its Western patrons, especially Washington. These days, we are all shocked by Obama Administration’s $38 billion pledge to this evil, monstrous regime. Something similar can be said of the influence of Wahhabism in the region. Wahhabism, like Zionism, isn’t some centuries old, time-honored religious sect, but a relatively new politically expedient but barbaric ideology. The modern roots of Wahhabism can be traced to Najd (the geographical central region of today’s Saudi Arabia) and the 18th century preacher Muhammad Ibn Abd Al-Wahhab (1703-1792) who claimed to "purify" Islam by returning it to what, he believed, were the original principles of that religion. Far from being regarded a legitimate interpretation of Islam, Al-Wahhab was opposed even by his own father and brother for his fundamentalist, fanatical beliefs. But the movement gained unchallenged precedence in most of the Arabian Peninsula through an alliance between Muhammad Ibn Abd Al-Wahhab and the House of Muhammad Ibn Saud, which provided political and financial power for Al-Wahhab’s ideologies to gain prominence. Eventually, this alliance gave birth to the Kingdom of Saudi Arabia. Following the collapse of the Turkish Ottoman Empire after World War I, the Sauds seized control of the Hijaz and the Arabian Peninsula and a nation was founded on the fanatical tenets of Al-Wahhab – the state-sponsored, dominant form of Islam in the birthplace of Islam. My initial interest in this area of Arab history admittedly began 20 years ago via David Lean’s epic movie, Lawrence of Arabia, starring Peter O’Toole. Through a love of that 1963 film, I first read T.E Lawrence’s book, The Seven Pillars of Wisdom, and then read several books concerning the exploits of T.E Lawrence and the Arab Revolt during World War I, as well as the Sykes-Picot Agreement (referenced by today’s ISIS in their “manifesto”) and the actions of the British and French colonial governments in regards to the post WWI Middle East. The setting up of the House of Saud as the “royal family” and the establishment of the Kingdom of Saudi Arabia occurred despite the fact that agreements had been made during the war to endorse and support not the Saudis but the Hashemites. It was the Hashemite Arabs, not the Saudis, who had launched the Arab Revolt against the Ottoman Turks and had been the most involved in the campaign. Yet it was the fanatical [and some argue heretical] Wahhabi-inspired Saudi faction that gained the real power from the post-war situation. The reason I reference this history is to point out that the Wahhabi-inspired Saudi Kingdom wasn’t the sole – or even the legitimate – claimant to that immensely privileged, immensely powerful position in the region. In fact, it was usurped just like the way Zionists usurped their way in, in Palestine. And what has been the legacy of this Wahhabi-inspired Saudi Arabia and its influence? Well, the influence on Arabia itself and much of the surrounding region is incontrovertible, aside from the fact that the Wahhabi doctrines have been a major influence on extremism, Jihadism, and terrorism down to today’s ISIS – the very embodiment of Wahhabism outside the Arabian Peninsula. Osama bin Laden himself was a Wahhabi. Almost all Jihadi extremists, including other Takfiri groups (such as the Salafists), follow an essentially Wahhabi ideology. A “takfiri”, by the way, is a Sunni Muslim who accuses another Muslim (or an adherent of another Abrahamic faith) of apostasy. The accusation itself is called “takfir” (in Arabic), derived from the word “kafir”, meaning unbeliever in Arabic, and is described as when "one who is, or claims to be, a Muslim is declared impure." At any rate, this wicked pseudo-Islamic dogma has been methodically disseminated across the Islamic world for decades, vis-à-vis Saudi sovereign funds, financing “education” and fanatical religious literature to universities and mosques everywhere from Egypt and Iraq to Pakistan and Indonesia. What’s worse, this Saudi-funded dissemination of Wahhabi-inspired propaganda has for a long time been spreading beyond Middle East and into Western societies, especially the Muslim communities in the UK, France, and the Netherlands, among others. A recent two-year study conducted by Dr. Denis MacEoin, an Islamic Studies Professor at the University of Fez, uncovered a hoard of malignant literature in as many as a quarter of Britain’s mosques. All of it had been published and distributed by agencies linked to the government of the Kingdom of Saudi Arabia. The leaflets, DVDs, websites, and journals are full of archaic and extremist statements such as homosexuals should be burnt, stoned or thrown from mountains or tall buildings, along with adulterers and apostates (those who try to change their religion) proscribed a similar fate. Women are portrayed as intellectually inferior and in need of “beating when they transgressed”, while children over the age of 10 should be beaten if they did not pray. Half of the literature is written in English, suggesting it is targeted at British Muslim youth who don’t necessarily speak Arabic or Urdu. The material, openly available in many of the mosques, eagerly advises the British Muslims to segregate themselves from non-Muslims who are seen as inferior. This isn’t new information, of course. Investigative journalists have uncovered similar materials on numerous occasions, while people who have actually grown up within the aforementioned Muslim communities have been aware of such ideas and literature for a long time. Saudi-funded Wahhabi literature can be cited as a major influence (though not the sole influence) on the indoctrination of young British men alienated from mainstream society and for the seduction of young men into extremist organizations like Al-Qaeda and ISIS/ Daesh the world over. Worse, in places like Pakistan where unlike the UK most young men aren’t privileged with access to a high standard of education or to reliable sources of public information, but instead have plenty of access to religious schools (madrasa) and mosques, many of which teach from this fanatical Saudi-funded curriculum. This is in fact a key point: The Saudi-funded literature have traditionally targeted poorer areas in the Muslim world, such as the poorest parts of countries like Pakistan, Somalia, Afghanistan, Bangladesh, Nigeria, Indonesia, etc., where there are limited resources and virtually no formal educational infrastructure. In those cases, Saudi wealth is able to pay for the building or upkeep of schools or mosques – but on the condition that only their Wahhabi-centered, backward-minded interpretation of Islam be taught and distributed. As a result of this process taking place over many years, thousands of impressionable young men have grown up on this extremist interpretation of Islam, because in essence it is being forced upon them while they lack access to more sophisticated education or information. Essentially, they just don’t know any better. Interestingly, it was traditionally less common [even suppressed] for this sort of Wahhabi-centered indoctrination to take place in more developed or sophisticated Arab countries such as pre-war Libya, pre-war Syria, the Wahhabi sections of Lebanon, or pre-war Iraq. This is partly due to the strong, secular, and independent nature of those societies which – at the state level, at least – were more invested in a sense of national pride and cultural identity than they were in religious fundamentalism. Indeed, in places like Syria and Libya, the state was engaged in a long campaign to suppress religious extremism of any sort. That, however, changed dramatically ever since the illegal invasion and occupation of Iraq in 2003, the NATO conspiracy in Libya, and the bloody war that has been imposed on Syria since 2011. Consequently, all these countries are now infested with all manners of barbaric religious extremisms. The so-called “Islamic State”, aka ISIS or ISIL or Daesh that has been injected into Syria and Iraq is essentially a movement that has 100% ideologically flowed from the Wahhabi doctrine of Saudi Arabia. ISIS is essence is Saudi Arabia without an embassy! That connection is further exacerbated by the fact that Saudi and Qatari arms and funding are largely behind these Wahhabi and Salafist savages, with the wars in both Syria and Libya largely bankrolled by the Saudis and Qataris and the emergence of ISIS largely being a consequence of that. It has been reported, for example, that Wahhabi preachers from Saudi Arabia are frequently in Aleppo, Syria, preaching to the armed savage Jihadists to carry out a “holy war” against the Syrian state at all cost. Yet, while the likes of Afghanistan and Iraq were subject to invasion (and the latter to deliberate near total destabilization), and the overthrow of the governments of Syria and Libya (two countries that had little, if any, influence on the growth of global Jihadism) were openly encouraged and aided by the major Western governments and Saudi Arabia – no doubt partly due to its wealth and value to Washington and her allies – have never at any point been subject to any threat or been held to international scrutiny over the cynical and methodical dissemination of extremist doctrines across the Muslim world. Going back to World War I, it’s worth reminding ourselves again that the Saudis weren’t necessarily supposed to be the rulers of Arabia. The Hashemite, Hussein bin Ali, was the Sharif and Emir of Mecca from 1908 until 1917. The Arab Revolt of World War I consisted of Transjordanian tribes, along with other tribes of the Hijaz and Levant regions, fighting against the Turkish Empire on the side of Britain and her allies. The revolt was launched by the Hashemites and led by Sherif Hussein of Mecca, not by the Saudis or Wahhabists. It was supported by Britain and her other World War I allies, who used the momentum of the Arab nationalists who wanted independence to further the broader war effort against Germany et al. The definitive chronicle of the revolt was written by T. E. Lawrence who, as a young British Army officer, played a key liaison role during the revolt. He published the chronicle in 1922 under the title, Seven Pillars of Wisdom. Lawrence himself was of course one of the most fascinating and iconic figures of the 20th century. While the Seven Pillars of Wisdom can be questioned for accuracy in some regards, even his detractors and enemies couldn’t refute the vital role played by the Hashemites in the revolt. It is a historical fact that the British government of the time promised the Hashemite Arabs far more than they delivered after the war. In September 1918, supporters of the Arab revolt in Damascus declared a government loyal to the “Sharif of Mecca”. Hussein had been declared “King of the Arabs” by a handful of religious leaders and other notables in Mecca. After the Turkish Caliphate was abolished, Hussein declared himself Caliph, “King of the Hejaz”, and King of all Arabs, Malik bilad-al-Arab, in Arabic. However, Hussein was ousted and driven out of Arabia by the Sauds; a rival clan with whom the Hashemites already had bad history, having earlier fought against them due to radical religious differences, primarily the fanatical doctrines of Al-Wahhab. Though the British had supported [and utilized] Hussein from the start of the Arab revolt, they decided not to help Hussein repel the Saudi attacks, which eventually seized the key cities of Mecca, Medina and Jeddah. With it went the hope of a Hashemite-ruled Arabia, though Hussein continued to use the title “Caliph” even in his exile. In the aftermath of the WWI, the Arabs had found themselves freed from centuries of Ottoman rule, but instead were under the colonial rule of France and Britain, despite British war-time promises that this would not be the case. When these colonial mandates eventually ended, the sons of Hussein were made the kings of Transjordan, later simply called Jordan, as well as Syria and Iraq. However, the monarchy in Syria was short-lived, and consequently Hussein’s son Faisal presided over the newly-established State of Iraq. But these were mere conciliatory offerings compared to what had originally been intended and desired by the Hashemites. It was the Saudis who were the real winners, being installed into a powerful kingdom that has lasted to this day and shows not the slightest sign of weakening. It is not an overstatement to claim that both Zionism and Wahhabism have been demonstrably divisive and destructive forces in the Mid-East region and beyond. Zionism has led to the unending plight and humiliation of the Palestinian people, as well as ensuring that the modern State of Israel be perceived in an entirely negative way which it is. In fact, all polls indicate that Israel is the least popular nation on earth! Meanwhile, Wahhabism has inspired an immeasurable amount of extremism, terrorism of the utter worst kind, indoctrination, and the toxic polarization of many Arab societies. We can look at the influence of Wahhabism in the world at this stage in time and legitimately call it a cancer. But what about its roots? 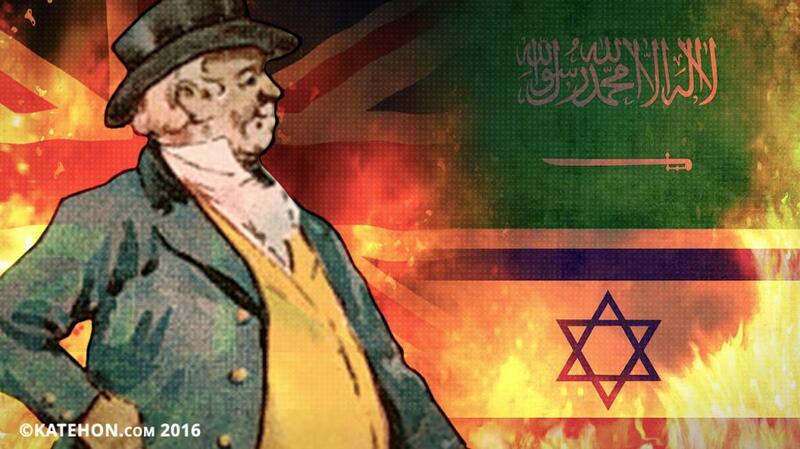 Given the prevalent view of the Zionist conspiracy behind the Balfour Declaration and so much of what has transpired since, is it possible that Wahhabism which began to gain momentum at around the same time, was also something much more than it appeared to be – even at the time? Is it possible that Wahhabism wasn’t just the product of some quaintly rustic Arabian desert preacher, but something far more cynical? The book, The Memoirs of Mr. Hempher, aka The British Spy to the Middle East, aka Confessions of a British Spy, has been regarded by some as a forged document; the document purporting to be the account of an 18th century British agent, “Hempher”, of his instrumental role in founding Wahhabism as part of a conspiracy to corrupt and eventually destroy Islam. This book first appeared in 1888 in Turkish. It has been described as an Anglophobic variation of the book, The Protocols of the Elders of Zion. Most conspiracy researchers know about the infamous Protocols of the Elders of Zion, which was regarded as blueprint of the global Jewish conspiracy. The Protocols of the Elders of Zion, like Confessions of a British Spy, has long been dismissed by some mainstream sources as a forgery or hoax. But is it? The Protocols have been widely translated and disseminated and is still regarded as factual and historical in much of the Muslim world, informing a great deal of the prevailing Middle-Eastern view of the Jews and the Zionists. Those who refute the validity of the book cite it as a massive contributing cause of Jew hatred in nearly all Muslim societies and beyond. Unfortunately the Nazis, like many in Muslim societies today, were intemperate, incapable of separating Zionism as a corrosive globalist political force from Jews as a people. The reality is that if the Protocols of the Elders of Zion was a legitimate historical item, the Zionism it depicts is no more representative of Jews as a people than Wahhabism is of the global Muslim community – which is to say that only a relatively small percentage of Muslims in the world are Wahhabis, and likewise in regard to the Jewish community and Zionism. But conspiracies of the kind we’re talking about operate at an insidious, often unperceived level. That is to say the number of Muslims and the number of Jews unknowingly subject to Wahhabism and Zionism respectively is much higher. But what of The Confessions of a British Spy? Is it mere coincidence that both of these political ideologies, both originating around the same time, both of which have ensured the long-term toxicity of the Middle East, both also happened to have books claiming to reveal their true origins and agendas – both of which were later dismissed by mainstream commentators as forgeries? Was Confessions of a British Spy telling the truth? Was Wahhabism founded by outside agencies as a long-term plan to corrupt Islam? Is it just a coincidence that this is EXACTLY what Wahhabism appears to have done over the course of a century – corrupted the great Islamic religion to the point where it is now widely regarded by many non-Muslims [as well as non-practicing Muslims] as a source of evil in the world? And what about The Protocols of the Elders of Zion? Is it a mere coincidence that the protocols being spoken in that document happen to fit perfectly in the observed realities of today’s global Zionism on steroids? Back to Islam, let us remember that this religion wasn’t always regarded with the kind of stigma that it now has, but rather the opposite. Islamic societies were historically perceived as having been intellectually and even scientifically enlightened at a time when western Christianity was characterized by superstitious backward-mindedness, inquisitions, torture, mass persecutions, execution pyres, and utterly ridiculous doctrines and proclamations. Historical accounts tell of the brutality of western Christian crusaders and the comparative nobility of Saladin and the Muslim armies. The Islamic world had its enlightenment long before the Christian West despite being a younger religion. At a time when Europeans were burning “witches”, the classical Islamic cities of Isfahan, Damascus, Baghdad, and Cairo were centers of learning and philosophy. The slow degradation and polarization of Islamic societies is a phenomenon that has only been happening in the last 100 years or so, as the growth of Wahhabism seems to have done its work, like a slow-acting virus with a long incubation period. And it is only in the last 10 to 15 years that the influence of Wahhabi doctrines has become a prominent international issue. In regard to the book, The Confessions of a British Spy, being a hoax, maybe it was, maybe it wasn’t. But one would wonder why such a hoax document [to slander a then-minor religious sect that wouldn’t have any great relevance until almost a century later] be created? The same goes for The Protocols of the Elders of Zion. Moving on, why didn’t the Western allies of King Hussein help the Hashemites when they were being driven from Arabia by the Saudsi after WWI? And why, for decades, have US, Britain, France and other world powers not made any issue over the Saudis’ funding of extremist literature and ideologies? And yet, we seem more than eager to jump in when there’s a chance to overthrow a secular leader like Gadhafi in Libya or Assad in Syria – both undemocratic dictatorships, perhaps, but both relatively idyllic societies when compared to Saudi Arabia (although not anymore, sad to say) and neither being a major factor in the indoctrination of young, frustrated, angry, impressionable minds across the Muslim world. What is the source of such profoundly inconsistent foreign policy? Why were the Saudis not brought to task when 15 of the 19 supposed hijackers on September 11 were allegedly known to originate from Saudi Arabia, not Iraq? Or were these supposed 15 patsies a valuable resource that Washington could cash in as its trump card, for example “the 28 missing pages from 911 report” that we have all heard so much about lately, in order to gain a geopolitical advantage over the Saudis and figuratively pull the rug from under them just as they did with Egypt’s Mubarak in 2011? The list of curious questions goes on and on. Without digressing too much and not complicate an already very complex issue, it should be kept in mind that one of the most prominent 9/11 conspiracy theories is the Phillip Marshall Theory which concludes that the WTC attacks were a US-Saudi-Israeli plot and not a mere Al-Qaeda operation. Two central and recurring features of most 9/11 conspiracy research are the possible involvement of Saudi agencies and the possible involvement of Israel’s Mossad in collusion with a broad array of US agencies. Putting that to one side, however, the point is that when we look at the history of the Middle East, it becomes increasingly difficult not to wonder if the divisions, general toxicity, the wars, and apocalyptic scenarios that are reaching their apex here at the beginning of the 21st century may have been orchestrated far back in history, having always been intended to reach this point. That is the view many have of The Protocols of the Elders of Zion – that the supposedly “hoax” document actually made this clear to a large extent. The more one studies history, the more one wonders if the truth about Wahhabism and its origins may not just be a similar tale, but a concordant operation, with these two ideologies – Wahhabism and Zionism – both operating hand-in-hand to create the toxic conditions in the region that we have today. It is also worth noting that the conspiracy hinted at in Confessions of a British Spy still – rightly or wrongly – enjoys a high level of currency in parts of the Middle East, particularly Iraq, where it is considered by many to be as legitimate as The Protocols of the Elders of Zion. It is also worth noting that as much as Washington is seen as propping up Israel, it is also seen as permanently propping up the Saudi regime, much to the displeasure of other nations and leaders in the region such as Gadhafi, Assad, and the Iranian Supreme Leader Ayatolla Khamenei, et al. Both the Zionist State of Israel and the Wahhabi Kingdom of Saudi Arabia could be regarded – and are regarded by many in the Middle East – as artificial states imposed upon the region and kept in place by Western powers (primarily Washington) for the purposes of a long-term agenda of God-knows-what. Just as Israel is armed to the teeth by its Western patrons, so too is the Saudi regime, which is currently decimating the small nation of Yemen in an illegal war and using almost entirely British or American weaponry – without one word of condemnation from Western governments. The perception is often inescapable that key Western governments march to the beat of the Saudi state, just as much as with Israel; and all of this being despite Saudi Arabia’s longstanding role as the key source of Jihadi terrorism. It is also increasingly evident that the Wahhabi and Zionist states have common interests and work hand-in-hand in many regards. This can be seen for example in their shared anti-Iran policies and their shared involvement in supporting the extremist ISIS war against the Syrian government. The destructive and hegemonic influence of Zionism has been written and talked about at tremendous length for many decades. But the Wahhabi doctrines can now be clearly seen to be behind most of the extremist, crazy Jihadi movements of the past several decades, including Al-Qaeda and now ISIS. It would be impossible to calculate how many minds and how many young men, across the world have been indoctrinated by Wahhabi influences. Saudi Wahhabism isn’t just an intolerant, barbaric misinterpretation of Islam. It is a death cult unto itself with a very shrewd and expedient political ways and means methodology. So is Zionism, which is often used to indoctrinate young Jewish people [and a whole lot of stupid American evangelical so-called “Christians”] to an essentially extremist, delusional, uncompromising viewpoint that deals in racial superiority and “divine right” to a land that is NOT theirs, to a land that was NEVER theirs to keep, if not for a short period of time which they utterly proved to be unworthy stewards as a result of which began their expulsion and diaspora. Wahhabism’s influence, much like Zionism’s, is largely invisible to those who superficially observe the events from outside and can almost be regarded as indoctrination by stealth. While no one has ever denied the existence of Wahhabism or its prevalence in Saudi Arabia, it has only been in recent years that the extent of Wahhabi material circulating around the Muslim world has started to be understood. While Saudi religious influence can’t be cited as the sole force behind the rise of fanaticism and extremism in the Middle East and much of the Islamic world beyond, it is a central factor, along with US foreign policy and the Zionist State of Israel. And if all of those factors were to be viewed operating in concert with one another and taken as one, then it would obviously be the principal driving force behind the terrible events in that part of the world. Even if you wanted to cite other causal factors instead – for example, populations being oppressed by various dictatorships – the argument could be made that those dictatorships have historically been propped up by either Saudi or US influence (or both) at some time or another (though not Gaddafi – and look how that ended up for him). If we look at the historic events of the so-called “Arab Spring” or better put Arab Chaos, some tend to forget that Bahrain, for example, had its own popular, grass-roots protests by civilians asking for basic rights and liberties. Those protests were crushed and received no support or actions of solidarity from Washington or other Western powers. Yet the powers-that-be went out of their way to assist the violent, brutal overthrow of Gadhafi in Libya and have now spent in trying to do the same in Syria and at maximum cost to the poor, defenseless Syrian people. Unsurprisingly, Gadhafi’s Libya and Assad’s Syria were/are two dictatorships with no sympathy or love for the Saudi Wahhabists. And the same can be said for Saddam Hussein’s Iraq, whereas the leadership of Bahrain has full Saudi support. Even more ridiculous, the Saudis were themselves being “consulted” by Western powers on what to do about the “Gadhafi problem”, just as they are principally “consulted” on what to do about Assad and Syria, just as they were a major influence on the campaign to remove Saddam Hussein from Iraq. It is curious that while regimes were collapsing or being attacked elsewhere in the region (even the Mubarak regime in Egypt), the Saudi regime never appeared to be in the least bit of trouble, despite being hated by so many of its own citizens as well as neighbors and despite being even more oppressive than the other regimes accused of being “undemocratic”. According to Social Scientist Quintan Wiktorowicz, even the term “Wahhabi” is often used by its opponents to denote foreign influence, particularly in countries where they are a small minority of the Muslim community, but have made recent inroads in converting the local population to the ideology. Through this long-term method of infiltration, foreign nations can be interfered with, movements stirred up and regimes damaged or even toppled. Muammar Gadhafi certainly knew about Wahhabists – and hated them with a vengeance. He also made the mistake of openly confronting the Saudi Royal Family at Arab Summits. Again, let’s note that neither Iran nor Syria nor Gaddafi’s Libya nor Hussein’s Iraq, ever contributed to the export or spread of extremism or terrorism against the West. But Saudi Wahhabism clearly has and is still doing so. It is still difficult for independent researchers to look at the international conspiracy that was conducted against Gadhafi and the people of Libya and not wonder what alliance of forces and interests were truly behind it and why. That subject warrants a whole essay in itself but by the same token it becomes difficult to look at the crisis that has torn apart once-peaceful Syria and not wonder the same thing, not to mention Iraq and the rise of ISIS. It is an established fact that the Saudis and their satellite client states have been funding and orchestrating the ultra-violent ISIS terrorists in Syria since the very beginning of that conflict. And it’s evident that Israel too has been involved in aiding the Syrian rebels. It is therefore quite reasonable to wonder if a Zionist/ Wahhabist agenda is being played out in unison with, of course, Washington Neocon backing. This isn’t, by the way, an attempt to all-out vilify Saudi Arabia or the Saudi state – which itself may be facing significant danger from Jihadi extremism – but more specifically its hard-line religious clerics and networks. The extent to which those networks are tied to the state itself is unknown. But there is almost certainly some degree of collusion involving highly-placed people in the state. In conclusion, it is of course beyond the scope of this article to comment decisively on whether The Protocols of the Learned Elders of Zion or The Memoirs of Mr. Hempher are 19th century hoaxes or genuine historic items that expose the true origins of two of the most destructive, toxic ideologies of the 20th and 21st centuries. What can be observed with utter objectivity, however, is the substantial role both ideologies have played in creating the harsh, apocalyptic-looking conditions we now have in the Middle East and much of the world beyond. Once you’ve familiarized yourself with the history, you cannot help but view the bitter sectarianism, wars, divisions, and bloodshed of today without perceiving the large shadows of Zionism and Wahhabism looming over them. And that’s before we even factor in the issue of Shia Islam. This is also particularly interesting in light of the fact that US policy in recent years has been to aggravate a false and contrived Sunni-Shia conflict in the region as much as possible. The Israeli intelligentsia is also majorly involved in fueling this geo-sectarian conflict. The bleak picture is one of a societal and political cancer seeded at the dawn of the 20th century and reaching its deadliest point at the beginning of the 21st: An agenda that pre-dated World War I which may bring about World War III itself.